Jeans: To transform into shorts. 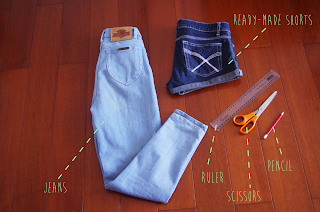 Try the DIY on an old pair first if you're a bit unsure! Ready-made shorts: Find a pair that fit you well and that you like the style of. Scissors: Fabric scissors would obviously be the best, but I don't any. Regular scissors are a little bit more difficult to cut with but totally usable. Pencil: Pen, marker, chalk - whatever takes your fancy. Align your existing shorts with the jeans you're planning to DIY with to get an estimate of the length/shape you want. 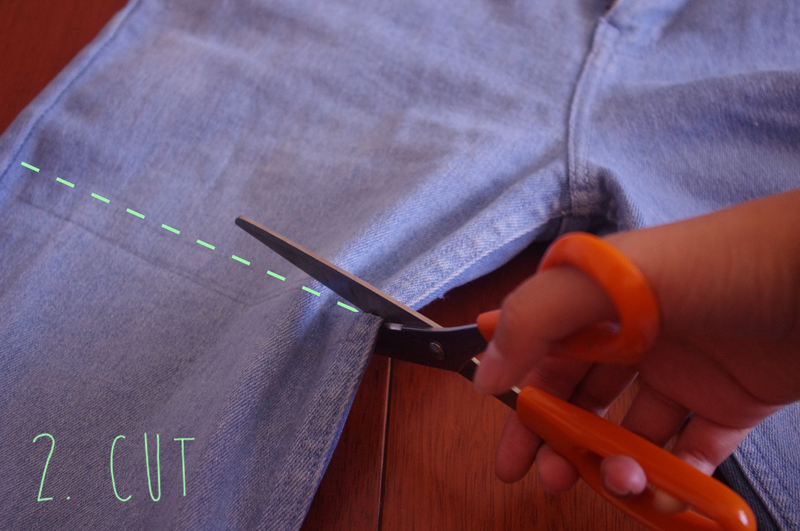 Draw a straight line (Tip: Make your line slightly diagonal, which will make the hem of your shorts slant upwards instead of just being horizontal. This provides a more flattering cut and elongates your legs) to mark off your desired length. Draw a second straight line slightly below the first. 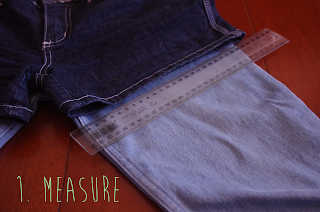 This will give you room to make mistakes or extra fabric to distress/cuff. You can always cut your shorts shorter, but you can't really make them longer! Try them on to check the lines are where you want them to be. Cut along the second line you drew for Step 1. Well done! You are now 'kind of done'. If you try it, please send me pictures or tell me how it goes! And feel free to ask me any questions.